Effective from December 2006, Crownhill have decided to publicly release the QuickBlue source code previously available as part of the Developer Kit. It will be free to all customers in a pre-compiled HEX file and source code will be available under a license derived from the BSD license model. View it here. To use the source code, download the ZIP file, and run setup.exe to install the developer package. Once you've got your source code and you're ready to develop, you can purchase the hardware you'll need from Crownhill's e-commerce site. The commercial version of QuickBlue Link will continue to be available for those who wish to purchase a ready-built solution. Crownhill's pioneering product for quick and easy Bluetooth integration. QuickBlue™ Link a fully transparent serial to Bluetooth data link. QuickBlue™ Link easily adds Bluetooth to your product without the need for Bluetooth design. The module contains full RF circuit including integral antenna utilising the CSR chipset fully qualified as a Bluetooth component and PIC™ microcontroller providing a simple to use, plug-in module with serial interface to the host application. Once installed, the module can interface to standard Bluetooth devices, e.g. Laptop computers, PDA’s, Mobile phones etc. Operating in slave mode, it initializes itself and waits for a remote device to connect. Quick and simple integration - We make Bluetooth work for you! Faster and cheaper. Profit by selling wireless products next week instead of next quarter. Technical Support Forum for PIC™ BASIC Developers. As of December 2006, Crownhill has released the QuickBlue Developer source code to the public. 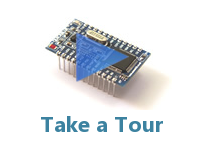 The core of the range is a small-footprint PCB module comprising of a PIC™ microcontroller and Cambridge Silicon Radio Bluetooth™ Chipset. A key feature is that the Bluetooth™ stack is embedded allowing the onboard PIC™ microcontroller to handle easy setup and configuration so that any existing RS232 can communicate wirelessly without the requirement for additional software to be written. Priced extremely competitively, The complete portfolio comprises three products, which can be used to embed wireless capabilities in new equipment, or add cable-free connection to legacy hardware. A fully transparent serial to Bluetooth™ data link. Easily adds Bluetooth™ to your product without the need for Bluetooth™ design. The module contains full RF circuit including integral antenna and PIC™ microcontroller providing a simple to use, plug-in module with serial interface to the host application. Once installed, the module can interface to standard Bluetooth™ devices, e.g. Laptop computers, PDA’s, Mobile phones etc. Operating in slave mode, it initializes itself and waits for a remote device to connect.